Liverpool started strong right from the first whistle but it was the Gunners who took the lead first. Prior to that, both teams had shown their vulnerable sides with misplaced passes to their opponents which led to goal-scoring opportunities. It was the first time the Reds had gone behind at Anfield in Premier League this season. Just as Arsenal thought they had a grip on the game, Liverpool responded almost immediately with two goals. Arsenal's defenders were once again caught out of position and simply had no clue where the ball would go and where their opponents would be running. At the end of the first half, Arsenal were trailing by a scoreline of 4-1. 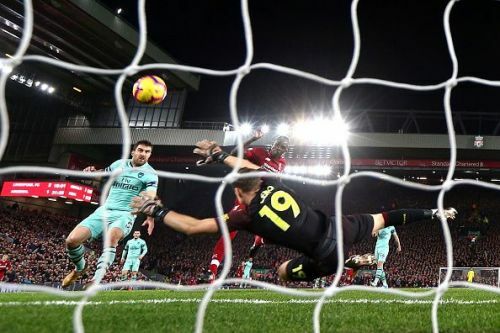 While there was time for an impressive second half to turn things around, Roberto Firmino's hat-trick through a penalty had all but sealed the result of the match. The Brazilian made it 5-1, which was the final score of the match. Arsenal defenders gave too many chances to their opponents who did everything to make the Gunners pay. There is no end to Arsenal's defensive miseries and this game could dampen the confidence of the players. Here was how the Arsenal players fared in the thrashing. Leno couldn't be blamed for the goals conceded because his defenders simply had let him down. The German's misplaced pass from the back meant that he still was not confident in starting the play short and distributing the ball to his defenders. Liverpool's penalties were well taken and Leno could do nothing about them either. The new keeper remained pretty alert on other occasions to prevent his side from conceding even more. Lichtsteiner was indirectly at fault for the first three goals that Arsenal had conceded in the first half. He was brought in to show leadership in the team, but the backline remains disorganised even with him. As a defender, he had not done much to help reduce the errors at the back, instead, he contributed to even more confusion and mistakes. Sokratis was foolish to give away the penalty after getting onto the wrong side of Salah. Just like the rest of the defenders, he could hardly cope with Liverpool's front three. Mustafi played a role in Liverpool's first goal after the ball bounced off his back and into Firmino's path. It was a bad day for him after having just returned from injury and he was replaced by Laurent Koscielny after the break. 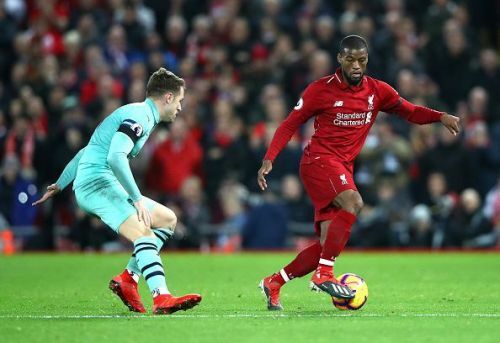 It was a great run from Maitland-Niles to meet Alex Iwobi's cross and tap the ball into Liverpool's goal and open the scoring for the Gunners. He also offered some creativity in the absence of Hector Bellerin and provided a number of good crosses for his team-mates. For the rest of the match, he remained largely anonymous. As Iwobi took charge of the left flank, Kolasinac was left behind in his own half. More often than not, he found himself under pressure as the Reds pressed high and forced every possible mistake from them. Without much doubt, he was at fault for giving away the second penalty of the night. 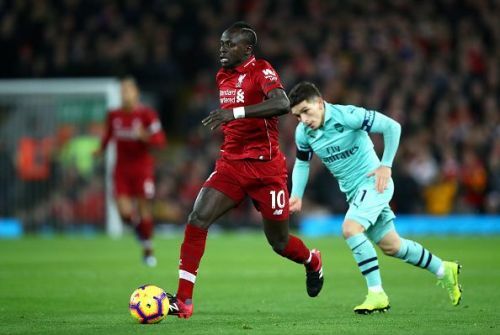 Torreira made multiple mistakes in the opening half and cost Arsenal dearly, especially in terms of Liverpool's second goal. He took too much time in passing and was easily outrun by his opponents. This match at Anfield could be his worst performance to date in an Arsenal shirt. He improved in the second half, but it was too late. With Liverpool's midfielders and attackers running the show, the midfielder could hardly find space to distribute the ball to the rest of his teammates. To not much effectiveness, he spent the majority of the time at the back trying to help out. Ramsey did little to help out in the defence, but he did try his best to create something out of nothing while attacking. There were some nice passes and flicks here and there, but he failed to leave an impression in the game. As compared to the previous matches, Iwobi has performed better than expected and he looked energetic in his runs. 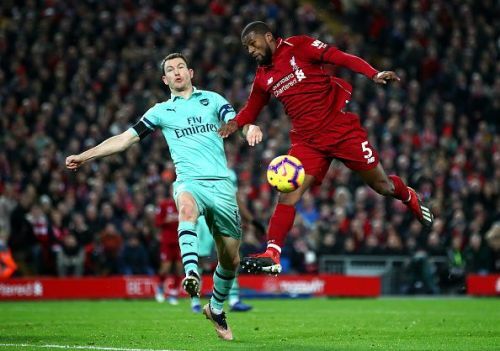 His cross into Liverpool's box helped Arsenal take the lead even though not for long. He remained lively when Arsenal advanced, but did not get many opportunities, especially in the second half. 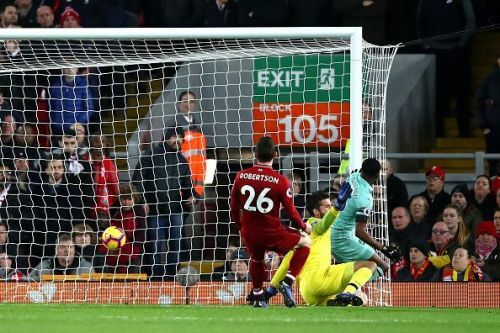 Aubameyang missed a great chance to pull one back for his side by lifting the ball over the crossbar, but he was ruled offside by the linesman. As Arsenal did not have much of the ball, the striker resultantly had one of the fewest touches in the match and later replaced by Alexandre Lacazette. The Frenchman adapted well after coming on for the second half, but Koscielny could not prevent his side from further embarrassment. The damage was done as much as the captain attempted to tidy things up a little. Lacazette came on for Aubameyang, but he could not break Liverpool's defence either. With the scoreline already at 5-1 when he came on, his presence hardly changed the game. The striker should have been given a penalty, but Michael Oliver failed to do so. Guendouzi came on late in the game and had little opportunity to impact the game.